In the fall of 1966, Jim performed three times on The Ed Sullivan Show. 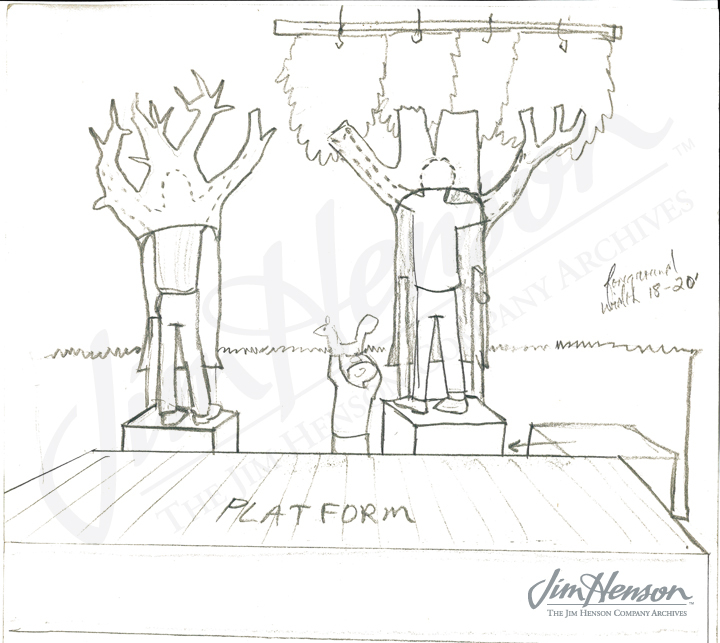 Heading into 1967, it was apparent that there would be numerous opportunities for the Muppets to appear again so Jim began to think about new material and original situations for his characters. 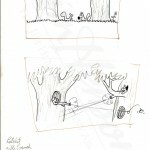 “The Squirrel Bit” that Jim mentioned in his journal was an ambitious one involving two squirrel puppets and two puppeteers in full-body tree costumes. 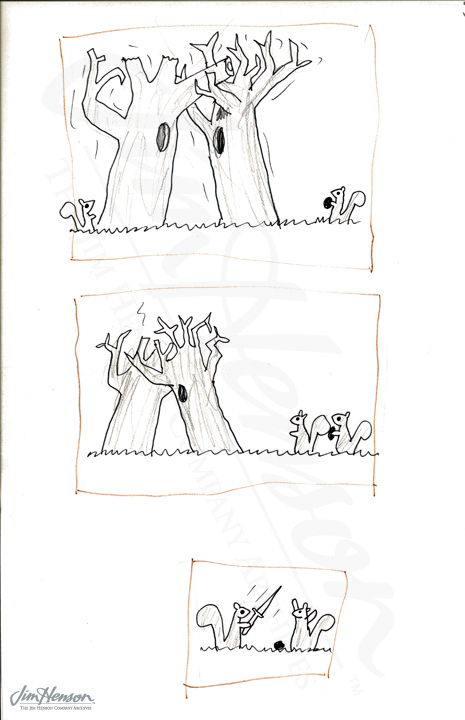 The idea was that the pair of squirrels would start a fight, slinging nuts, and it would escalate, with the squirrels firing ammunition from branches. 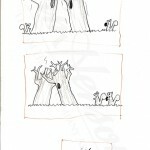 Eventually, the trees themselves would get into the act, wrestling each other off the stage. 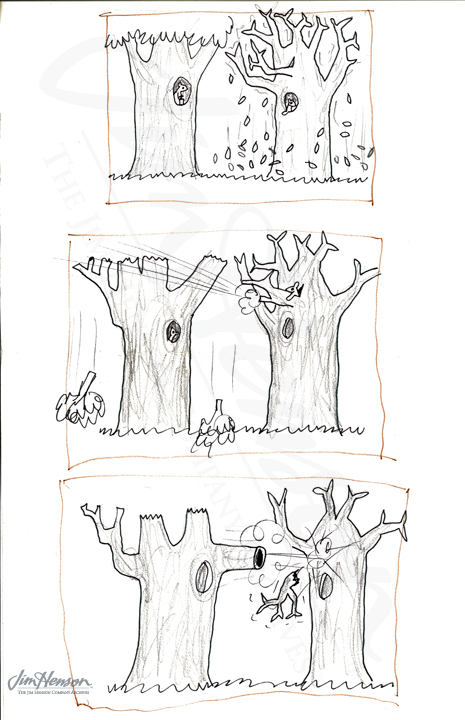 Jim drew brief storyboards with the squirrels and diagrams of how the tree puppets would work, but did not seem to write a script. 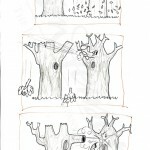 It’s unclear exactly how the bit would have ended – his sketch just shows one squirrel menacing the other with a knife. 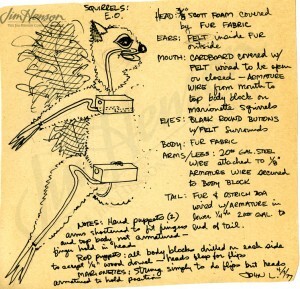 Perhaps discouraged by the complications of the staging or the lack of an effective finish, Jim did not end up performing “The Squirrel Bit” on Sullivan’s show. Muppet squirrels did appear years later — chased by the Swedish Chef on The Muppet Show and doing acrobatics in Emmet Otter’s Jug-band Christmas. 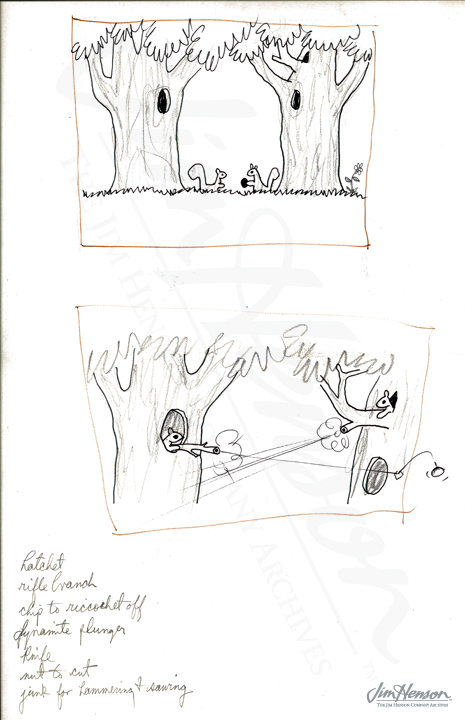 Jim’s storyboards for “The Squirrel Bit,” 1967. 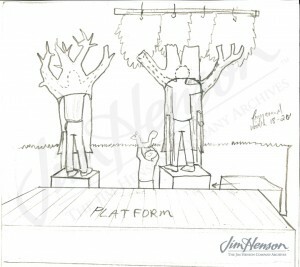 Jim’s diagram of the tree puppets for “The Squirrel Bit”, 1967. 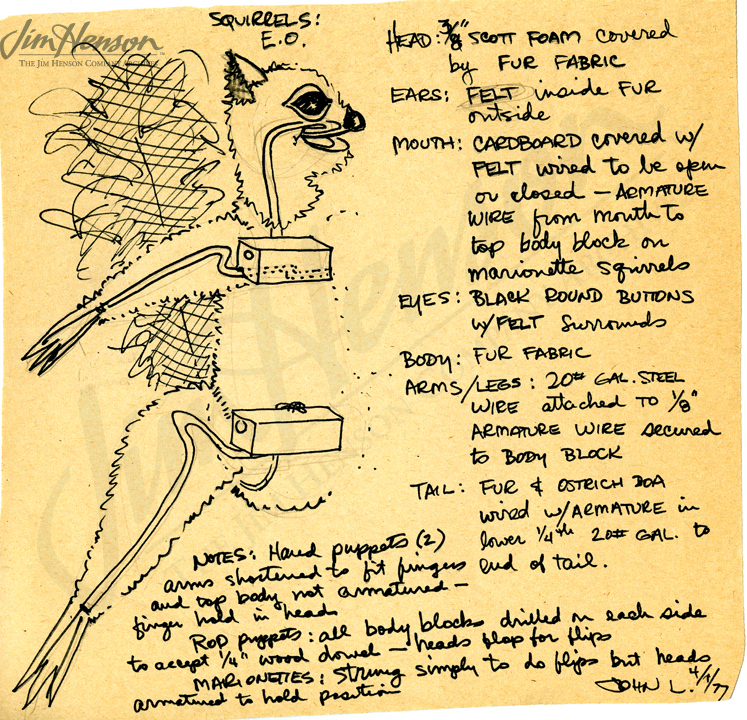 John Lovelady’s squirrel design for Emmet Otter, 1976. This entry was posted in 01-January '67, 1967, Appearances and tagged Ed Sullivan Show, Emmet Otter’s Jug-band Christmas, Muppets, squirrels, Swedish Chef, The Muppet Show. Bookmark the permalink.